Meet the two sets of Bobbsey twins: Flossie and Freddie and Nan and Bert. Join them as they escape a ferocious bull, witness a shipwreck, set sail on a houseboat, and go camping. Travel to New York City, the West Indies, and Washington-or stay in Lakeport, the eastern city that is home. Solve mysteries including buried treasure, fires, missing money, and thieves. 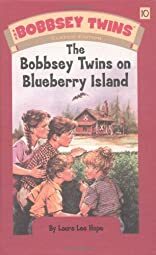 Stay with The Bobbsey Twins throughout their adventures!